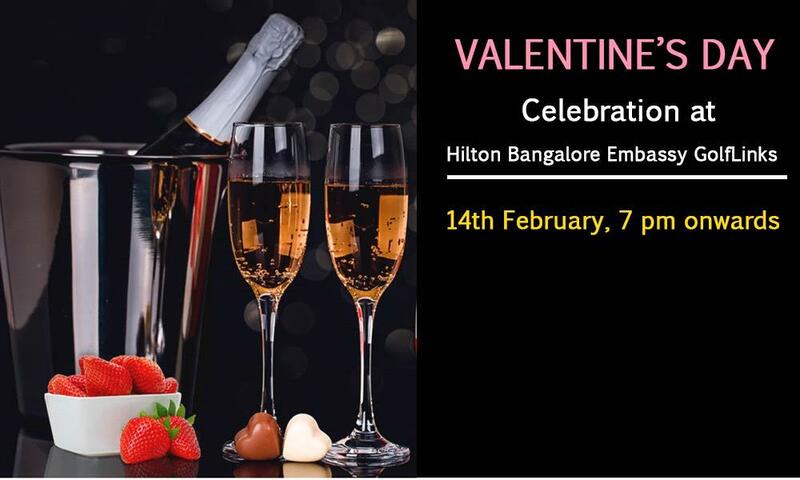 Valentine’s Day Celebration will be at Hilton Bangalore Embassy on 14th February 2019. Have you got enraptured by the sparkling Valentine’s magic around you yet? Get smitten by the love and joy of celebrating with dear ones and feel the warmth of affection in this season. What better way to begin this season of love than to indulge in a range of scrumptious offerings by Hilton Bangalore Embassy Golf Links. In the lap of luxury, the most romantic space in the city is doling out the best of music to celebrate Valentine’s dinner. At The Salt Grill a speciality grill house serving the choicest marinated meats and vegetables on a unique Himalayan pink salt platter, our chef is all set to take you and your beloved on a gastronomic journey spanning 5 delectable courses, welcome cocktail. Enjoy our scintillating poolside ambience and live crooner, we even have cabanas to make your romantic night a bit more private, celebrate love as you pop open a complimentary bottle of bubbly and raise your glass to love!